Members of Operation Wanya Tsotsi patrol the streets of Galeshewe. 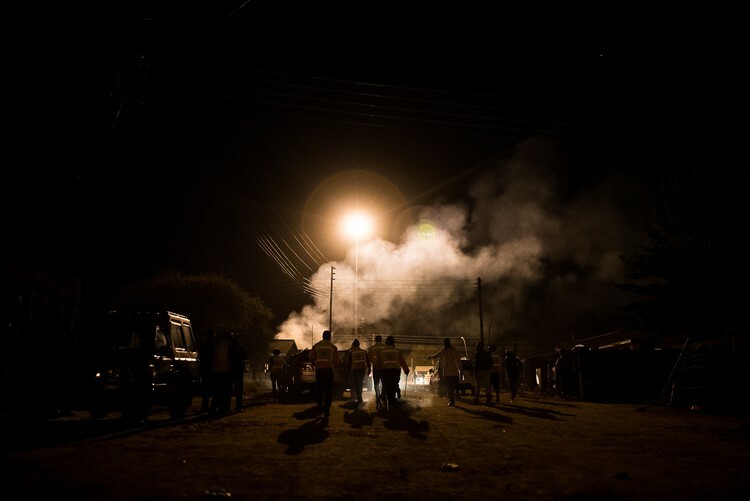 Part two of a three part in depth feature on Vigilantism in South featuring Operation Wanya Tsotsi from Galeshewe, Kimberley. Members of Operation Wanya Tsotsi administer a “blessing” to a suspect. Text by Christopher Clark. Photos by Shaun Swingler. Missed Part one of this series? Click here to read. Similarly, the group’s Operations Manager Spencer Plaatje has told GroundUp: “I am an activist, not a vigilante” before proudly invoking his famous ancestor Sol Plaatje, one of the founders of the African National Congress (ANC). But both Obusitse and Plaatje concede that this was not always the case: “Back in the early days, we’d beat the living daylights out of you. I think we’ve matured a lot since then,” says Plaatje. Pantsi Obusitse, Operation Wanya Tsotsi’s chairperson, insists that current legal criminal justice frameworks are failing in South Africa. Obusitse adds that after the first mass community gathering that sought to confront Galeshewe’s rampant gang problem, and from which Operation Wanya Tsotsi was born, it was “only by the grace of God” that no one was killed. When the gang leaders were eventually tracked down by the community over the subsequent days, Obusitse admits they still received a “brutal” beating. “They were seriously assaulted by a lot of people in a way that you couldn’t believe that humans could do something like this to another human,” he says. Obusitse, like Plaatje, insists that Operation Wanya Tsotsi has become much more “disciplined and structured” since then. However, some of the group’s methods of extracting information from suspected criminals and meting out justice undoubtedly are illegal and are unlikely to ever be overtly condoned by official state organs. Sjamboks are an integral part of that approach, routinely used by both male and female members of Operation Wanya Tsotsi to administer justice. GroundUp has also witnessed suspected criminals being struck around the face, shocked with Tasers and kicked. One Operation Wanya Tsotsi member described how in winter the group liked to hold suspects under a cold tap until they gave up whatever information was being sought from them. “You should see how fast they talk when we do that,” he said with a laugh. Similar tactics have been used to lesser or greater degrees by various vigilante groups across the country, most notably Mapogo A Mathamaga, a notoriously violent movement that achieved nationwide fame after it burst onto the scene in Limpopo. 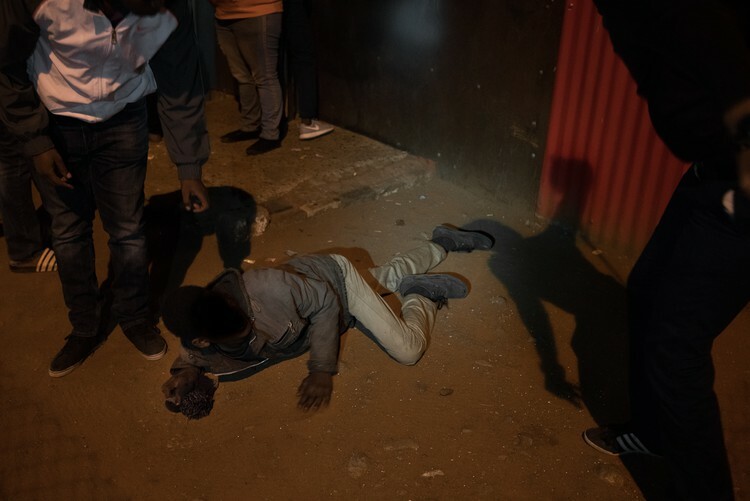 But even in democratic South Africa, the term is still often associated with the mob justice killings that occur across many crime-afflicted and underserved townships, although Nel says that vigilantism has become much more of a “grassroots crime-fighting” trend. In such instances, alleged criminals are often beaten or burnt to death by large crowds, a grizzly throwback to the political violence of the 1980s, when many suspected apartheid collaborators suffered the same fate. Mapogo’s former leader, a charismatic and divisive businessman named John Magolego, was a member of the National Party in 1993, though he would later repeatedly and flippantly change his political affiliations. It’s been alleged that to acquire a business in the former Lebowa homeland where Mapogo originated, support for the National Party was a prerequisite. The Mapogo movement was initially spearheaded by a group of local business owners like Magolego, placing a firm emphasis on protecting their own kind from spiraling youth criminality. Although Operation Wanya Tsotsi’s membership has a much broader age and employment demographic (many members are both young and unemployed), the rhetoric of its leaders often displays a conservatism and nostalgia similar to that of Mapogo. 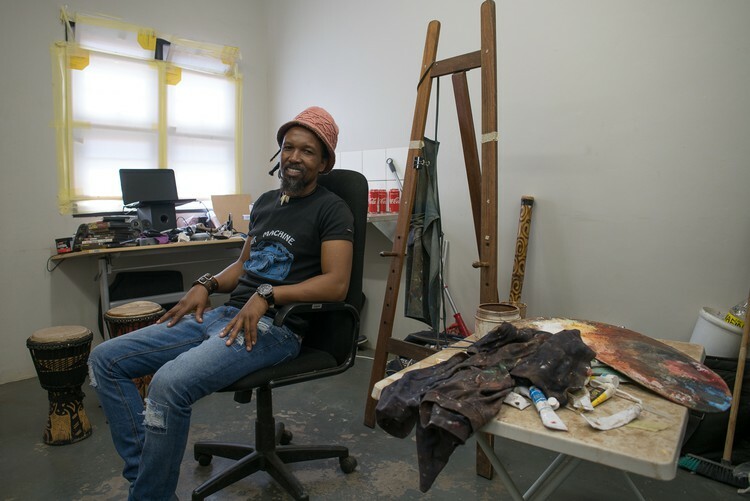 Tsepho Mathloko, Operation Wanya Tstosi’s deputy chairperson and a well-known local artist, says that young people in Galeshewe no longer respect their elders. But for any initial overzealousness, Operation Wanya Tsotsi has never threatened to reach the same level of violence as Mapogo. In November 1996, just months after Mapogo began, a mob marching under its banner beat two prison escapees to death. Between 1996 and 2000, there were a total of 139 charges for common assault, 82 for serious assault, 23 for kidnapping, 19 for attempted murder, 13 for murder, nine for theft and six for robbery, laid against members of Mapogo. A total of 300 Mapogo members were arrested during this four-year period, including John Magolego, who has himself faced multiple murder charges. Operation Wanya Tsotsi has repeatedly prevented the kind of mob justice attributed to Mapogo from exploding in Galeshewe. In 2015, their members stopped an angry mob from burning down the house of a sangoma who had allegedly abducted a young girl for a ritual killing. They also protected local foreign-owned businesses from being looted and razed to the ground when xenophobic violence in Gauteng threatened to spill over into Galeshewe that same year. In a particularly compelling case in March 2017, Operation Wanya Tsotsi went so far as to chase down two of their own members who were among five men suspected of murder; one had attempted to flee Kimberley by train bound for Cape Town. The organisation used its expansive community network to apprehend him when the train pulled into Hopetown, then turned him immediately over to the police. But none of this stopped the magistrate in the murder case from taking a stab at Operation Wanya Tsotsi, saying it was “ironic” that two of the accused “belong to a group that is meant to protect the community. They work with the police but are now the perpetrators, accused of taking the law into their own hands.” The magistrate made no mention of Operation Wanya Tsotsi’s role in apprehending the suspects, nor that members of the group had gathered outside the court on the day of the trial to oppose bail for the suspects. 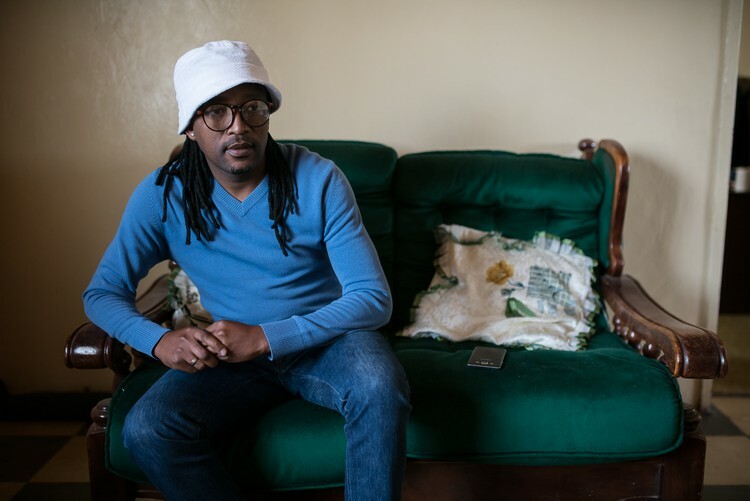 Increasingly frustrated and disillusioned with police management in Galeshewe, with the courts and with local government, Obusitse has been trying to use Operation Wanya Tsotsi’s considerable online presence to draw attention to the group’s plight at a national level. In July, the group helped to lure Deputy Police Minister Bongani Mkongi to Kimberley to discuss the lack of police resources in Galeshewe and other surrounding areas. However, Mkongi predictably joined the chorus calling on Operation Wanya Tsotsi to join the Community Policing Forum (CPF) – only then would the group be supported by the government, he said. At this time, a former private investigator called Barry van Zijl formed a close relationship with John Magolego. Van Zijl’s son Renus Muller says his late father played an important role in urging the Mapogo founder to make this unprecedented transition from vigilante group into private sector business. 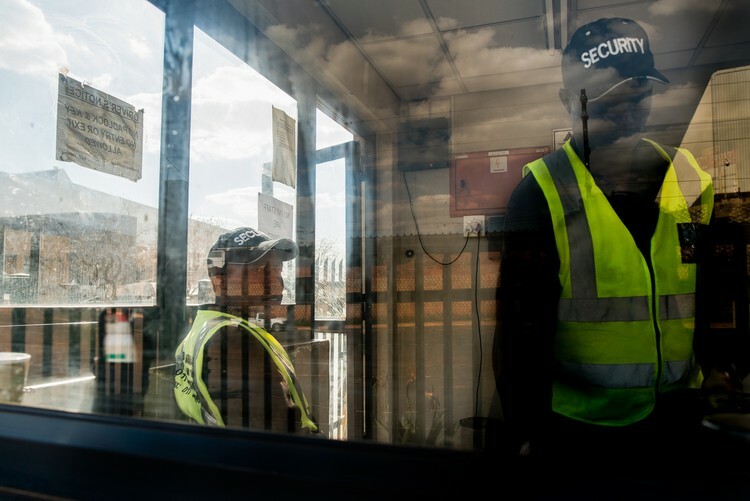 Mapogo guards at a business site in Johannesburg. Mapogo has gone from a notorious vigilante group to a well-known private security company. If Operation Wanya Tsotsi continues to resist being co-opted into existing state frameworks like the CPF, could the group end up being forced to follow Mapogo’s example and become a private business? With satellite branches of Operation Wanya Tsotsi having opened up in other towns including Ritchie and Kuruman, the movement is certainly gaining traction. Such questions about how best to continue that growth and sustain the movement’s future will only become more widespread. GroundUp is a news agency. Our articles are made available for republication, usually under a Creative Commons license, to news publications. We report news that is in the public interest, with an emphasis on the human rights of vulnerable communities. We want our stories to make a difference. We value high-quality, ethical journalism. 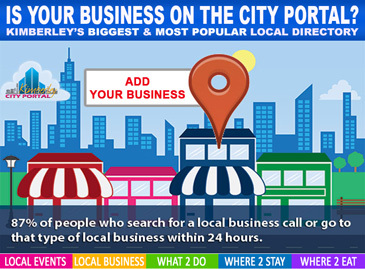 We are independent and do not promote any political party. Controversial news stories are fact-checked before they are published. We try to write in plain language. We also solicit and publish opinion pieces. We prefer opinion pieces that are fact-rich from people who work in the field about which they are writing. GroundUp started in April 2012 as a joint project of Community Media Trust and the University of Cape Town’s Centre for Social Science Research.